No seven-seat SUV has ever pampered its passengers and delighted its driver as much as the new Audi Q7. 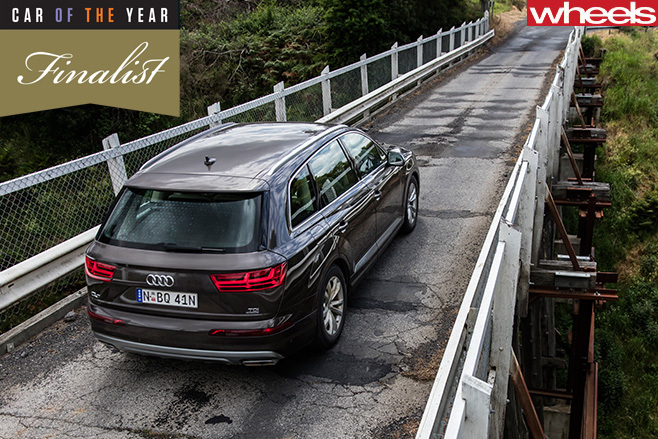 Rarely does an SUV come along that makes such a mark on Car of the Year. The last was the Ford Territory in 2004 – and it won. 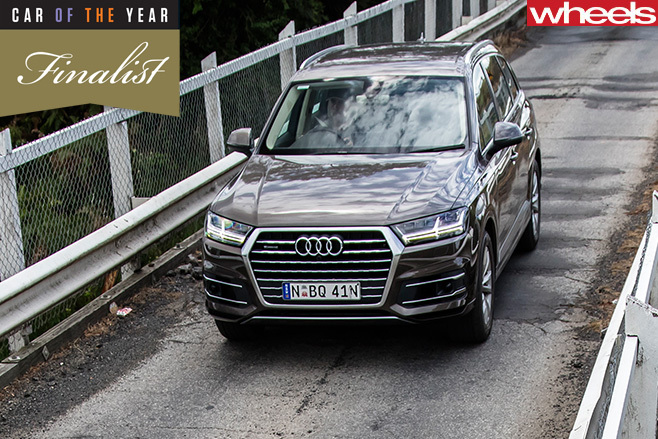 The second-generation Audi Q7 – unfashionably late, but a vast leap over the original – resets the dynamic standards to which other luxury SUVs will now be measured. It proves raising the centre of gravity by a few centimetres doesn’t have to compromise everything from cornering nous to ride quality. The Q7 is cold, aluminium-infused proof a luxury SUV can (almost) drive like a passenger car while delivering on the interior flexibility and accoutrements expected of the family-friendly breed. Key to the Q7’s advances is its stellar weight-loss program, enough to see it wholeheartedly dispose of the unflattering ‘QE7’ nickname of its predecessor with a reduction of about 10 percent. Credit goes to the full aluminium body (saving 95kg) and lighter components. For example, the single V6 turbo-diesel engine on offer for now (an e-tron hybrid is coming) weighs 20kg less. Some of that Jenny Craig-esque debulging is also attributable to smaller external dimensions. Yet clever packaging has liberated more interior space. 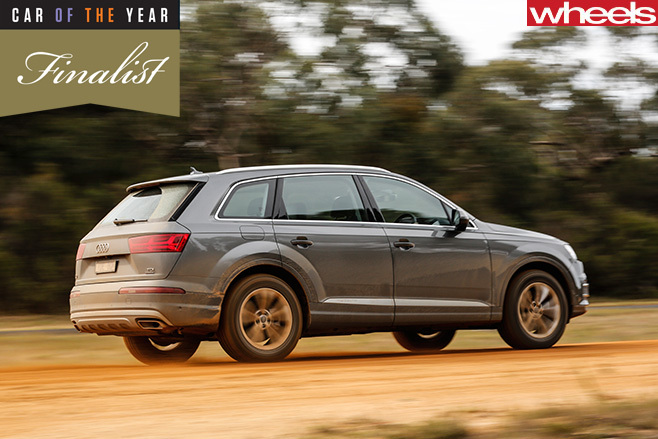 The Q7 has genuine style and thoughtfulness in its cabin. Combining the customisable 12.3-inch Virtual Cockpit with the retractable 8.3-inch colour screen makes for easy infotainment navigation. When paired with elegant materials and a clean, functional layout it reasserts the luxury oozing from every pore. It is a lovely place to be. The further aft the COTY judges ventured the more they appreciated the flexibility of those seats, too. The second row flips, slides and folds in a 40/20/40 configuration, while the pair of individual third row pews glide elegantly into the floor at the push of a button. Topping it off are the child-seat anchor points in the third row. Such is the hushed eloquence of the Q7’s cabin it was inevitably used as the multi-person transport when logistics required, reaffirming that those in the third row are treated with the same level of aural comfort and respect as those up front. Indeed, the Q7 injects limousine luxury with sedan-like dynamics and levels of comfort until now not experienced in an SUV. 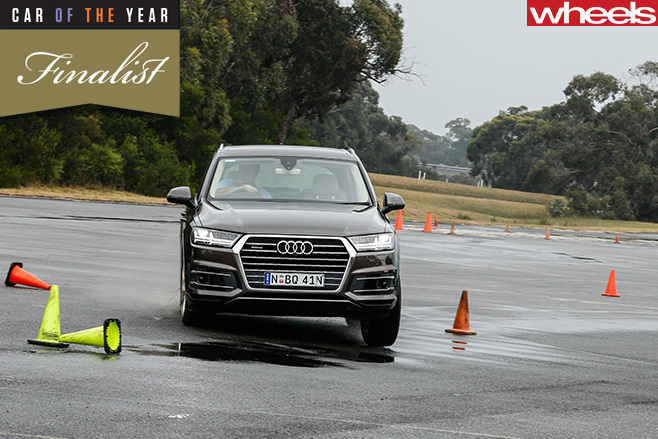 There wasn’t a COTY judge that exited the big Audi without praising its class-leading refinement. 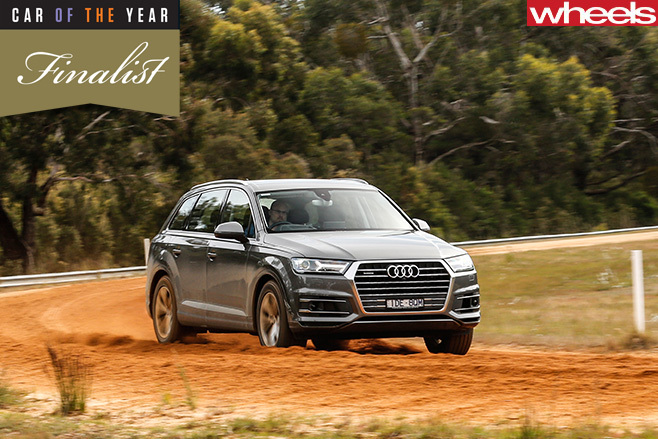 That refinement – in judges’ eyes deemed impressive at a price tag double the Q7’s $103,900 ask – helped comfortably advance the Audi through the 2016 COTY testing ranks. Yet the long-awaited newcomer impressed from the second it hit the sodden Lang Lang proving ground on our first day of testing. That a car with the size and space of the Q7 can tackle corners with such surety and fluidity is testament to the engineering efforts beneath. The 3.0-litre V6 diesel is also a ripper; as adept at effortlessly shuffling the big body forward as it is at containing almost all nasty and unwanted diesel drone. Teamed to the seamless eight-speed automatic, it makes for an impressive drivetrain well-suited to the relaxed nature of the car. Fuel use wasn’t as impressive. While the 5.9 litres per 100km sticker is startling, the reality is less so. 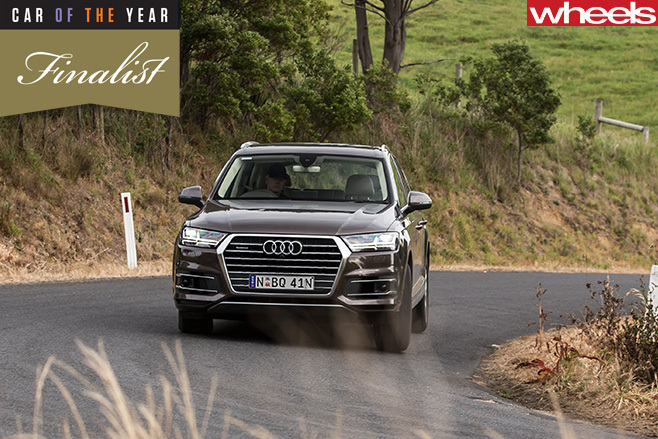 The Q7 used close to double that to complete the long COTY country loop, driven with spirited bursts, but with a lot less of the everyday stop-start that typically inflates fuel figures. 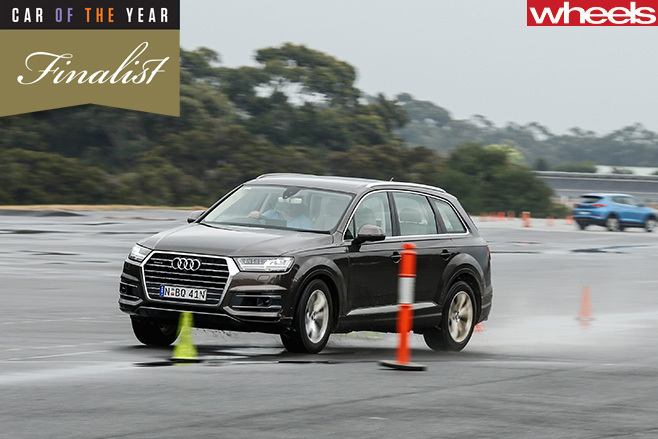 While the Q7 3.0 TDI is currently the only model available in Australia, we enlisted two examples for testing; one with standard steel coil springs, and one with the optional air suspension system. Both cars rode on 19-inch Pirelli rubber, yet the two gave markedly different results, with the $4950 air-sprung option briskly deemed expensive, but worth it. A rare dynamic hiccup was its dirt braking performance, while after some good ol’ COTY punishment, its brakes could become stinky and smoky following heavy applications. Safety has also taken some significant steps with the Q7. For example, the auto emergency braking has been calibrated to recognise oncoming traffic and apply the brakes if the driver plans to turn across oncoming cars. Of course, there’s a giant, diesel-slurping elephant in the COTY room when discussing Audi: are buyers really getting what’s printed on the brochure? Audi and its parent Volkswagen have been front and centre for lying to customers regarding vehicle emissions for years, something that fuelled heated debate by the COTY crew. 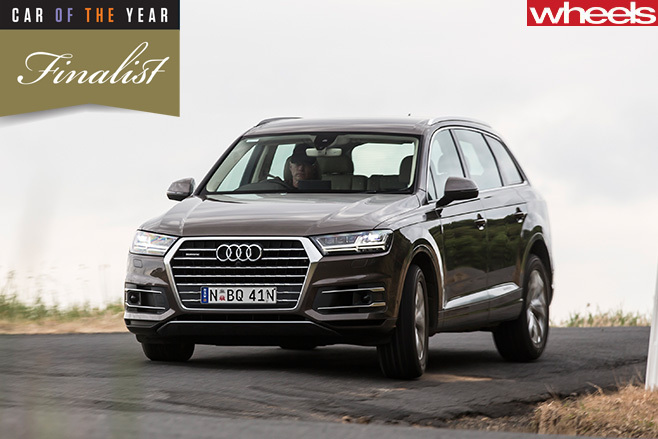 The Q7 and this latest diesel engine – loosely related to the former V6 – have so far escaped the controversy. But the company’s tarnished reputation leaves a sour “what-next?” taste, and every judge took that into consideration. In the end it was value that partly worked against the Q7. Yes, there’s core engineering beyond the six-figure price, but more features – there’s loads of the cool stuff relegated to the options list – would help offset the inevitable sticker shock those looking at a BMW X5 or Volvo XC90 may experience. Still, there’s little overlooked in Audi’s most convincing and complete car to date.